Maybe you’re presenting poster, a paper on a panel, or a project at the Research Network Forum. Or maybe you’re not presenting at all and just traveling to Portland to learn, network, and eat at one of the many renowned trucks. Maybe this is your very first time attending or presenting at CCCC—if so congrats and welcome! Regardless of what brings you, you’re going to the Conference on College Composition and Communication (CCCC)! Hurray! 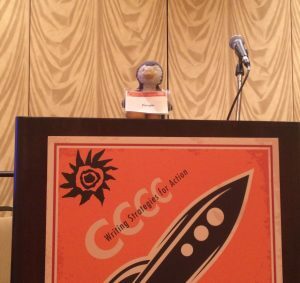 Pengie was nervous about her first CCCC presentation, but with some practice and words of affirmation, she rocked it! This year will by my third CCCC experience. My first trip was overwhelming, exciting, and honestly life-changing. This year, while I still don’t feel like a veteran or an expert, I do feel more comfortable navigating the massive conference that is CCCC. Hence, I write to you now as a fellow graduate student who has been there, done that, and got the CCCC pint glass. Imagine that the following tips are all prefaced with a giant YMMV: Your Mileage May Vary. I realize that everyone has different goals, different needs, and different limits, so of course, take what is useful for you and forget the rest! 1. My first and most important tip is this: prioritize self-care and schedule in breaks. Traditional advice on attending conferences as a graduate student stresses doing ALL THE THINGS: panels, parties, meetings, meals, networking, etc. But that advice ignores the fact that conferences can be intensely draining—physically, mentally, and emotionally. So often, graduate students feel guilty about missing events, but we should never feel guilty about taking care of ourselves. Personally, I try to attend two official conference events a day. One day, that might mean I go to a panel and then participate in the Disability Studies Standing Interest Group (SIG). The next day, I may go to two panels. I leave lots of time open for naps, meals, exercise, and catching up with friends, and two years ago, I had to schedule time for pumping. And of course, be flexible with your schedule: you may find that you over committed and need to scale back. That’s fine too! Give yourself permission to breathe. 2. There are so many different panels, so when I am looking at the program, I ask myself, “what question do I want answered at this conference?” I make sure that isn’t a question I can easily have answered within my program. One year, I asked, “how are people in the field doing research on Twitter?,” and then I located all the panels that might help me answer that question. Each year, I also try to answer the question, “what are the new and future directions for my field, disability rhetoric?” As the only disability rhetoric scholar in my program, I use CCCC as an opportunity to learn all I can about my field. 3. Keep an eye out for the CCCC 2017 Accessibility Guide, a resource compiled by the Local Accessibility Committee that outlines all the accessibility info for the conference: it includes notes on the conference space, lodging, public transportation, wheelchair rental, sign language interpretation and CART (real-time captioning), and more. In the Accessibility Guide, you’ll find out where the Quiet Room is—a great space to rest if you need a break—as well as the lactation room and Family room. It’s not published yet, but it will be posted on the main CCCC website soon. You can also check out the Access Table at the conference for interaction badges, handouts on accessible presentations, and other resources! 4. Check out events held specifically for graduate students and newcomers. WPA-GO holds a social on Thursday night that always includes a free drink ticket for attendees. The CCCC Newcomers Coffee Hour (Thursday 7:30-8:15AM in Portland Ballroom 252) is a great opportunity to get some free food, hear from the conference chair, and meet new and veteran community members. The deadline has passed for Mentoring @ CCCC (M@C’s), the cross-institutional mentoring program run by WPA-GO (Writing Program Association Graduate Organization) and 4CSOGS (CCCC Committee on the Status on Graduate Students), but you can reach out to the organizers for information about the M@C’s breakfast and appetizer gatherings. (You may have noticed that free food is a theme here!) Lastly, C’s the Day has gamified meeting new people and learning more about the conference. Check out the Facebook page for more information, and if you participate, you can win awesomely geeky trading cards of famous composition scholars and a Sparkle Pony! 5. In addition to the newcomer and grad student events, CCCC offers various opportunities to meet people from other institutions. I always make time to attend caucuses, SIGS, and meetings. No matter what you’re interested in—game studies, basic writing, teaching in prison, etc.—or how you identify—queer, American Indian, black, etc.—there’s likely a member group for you! You can see the list of member groups here, and check the program to find the scheduled meeting time. I’m particularly excited about the Coalition of Feminist Scholars in the History of Rhetoric and Composition’s Wednesday evening mentoring event about work/life balance! 6. This next tip will not apply to everyone, but I always have a blast live-tweeting CCCC using the hashtag. This year, it’s #4C17. Tweeting at conferences helps me in three ways: first, when I am attending a panel, live-tweeting keeps me engaged. I have to pay attention in order to compose a 140-character summary of the main ideas of a talk. And afterward, I appreciate having notes from the presentations. Second, tweeting with the hashtag connects me with other conference attendees. I tweet questions to presenters, who then respond with an answer. We keep the conversation going beyond the panel and beyond the conference. I have made friends on the hashtag as well, leading to the joyful experience of running into someone in the hallway and saying, “Oh! Aren’t you @AwesomeSauceRhetorician on Twitter?” Third, different groups will use the hashtag to promote their events and/or let conference goers know if there’s left-over food for everyone to enjoy (I really love free food). 7. Lastly, use CCCC as an opportunity to develop as a scholar, teacher, and human. I approach CCCC with humility and openness. I am not here to be the smartest person in the room. Instead, I’m here to learn from others, to ask genuine questions, and to score as much free food as I can. 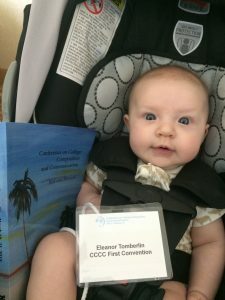 If Eleanor can rock her first CCCC, you can too! Veteran CCCC attendees, what tips do you have for grad students going to CCCC?